Materials in the nanometer range have been produced for several decades. Carbon Black, for example, has been used in tires since 1930. Today, the production capabilities for specially designed nanomaterials have increased considerably. Most synthetically produced nanomaterials are nanoparticles. The various applications require precisely defined nanoparticle characteristics. A number of production processes have been developed to meet the desired shapes, compositions and size distributions. This article describes the most common production processes such as milling, gas phase and liquid phase technologies. 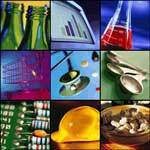 Nanomaterials and/or nanoparticles are used in a broad spectrum of applications. Today they are contained in many products and used in various technologies. Most nanoproducts produced on an industrial scale are nanoparticles, although they also arise as byproducts in the manufacture of other materials. Most applications require a precisely defined, narrow range of particle sizes (monodispersity). Specific synthesis processes are employed to produce the various nanoparticles, coatings, dispersions or composites. Defined production and reaction conditions are crucial in obtaining such size-dependent particle features. Particle size, chemical composition, crystallinity and shape can be controlled by temperature, pH-value, concentration, chemical composition, surface modifications and process control. 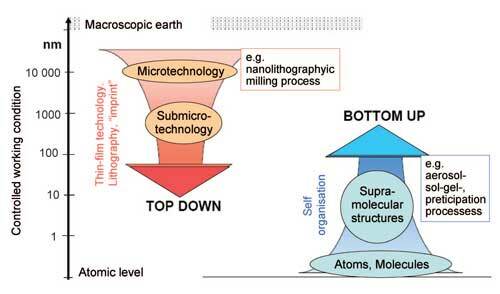 Two basic strategies are used to produce nanoparticles: 'top-down' and 'bottom-up'. The term 'top-down' refers here to the mechanical crushing of source material using a milling process. In the 'bottom-up' strategy, structures are built up by chemical processes (Figure 1). The selection of the respective process depends on the chemical composition and the desired features specified for the nanoparticles. 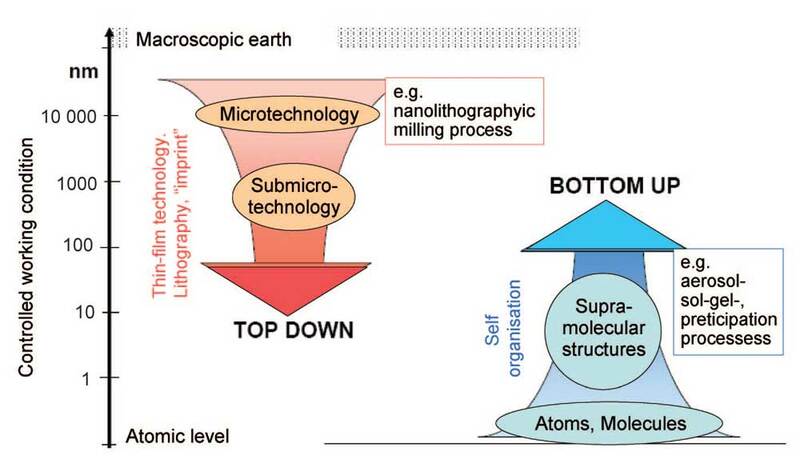 'Top-down' refers to mechanical-physical particle production processes based on principles of microsystem technology. 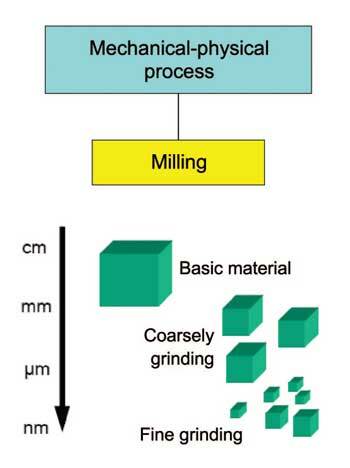 The traditional mechanical-physical crushing methods for producing nanoparticles involve various milling techniques (Figure 2). The mechanical production approach uses milling to crush microparticles. This approach is applied in producing metallic and ceramic nanomaterials. For metallic nanoparticles, for example, traditional source materials (such as metal oxides) are pulverized using high-energy ball mills. Such mills are equipped with grinding media composed of wolfram carbide or steel. Milling involves thermal stress and is energy intensive. Lengthier processing can potentially abrade the grinding media, contaminating the particles. Purely mechanical milling can be accompanied by reactive milling: here, a chemical or chemo-physical reaction accompanies the milling process. Compared to the chemo-physical production processes (see below), using mills to crush particles yields product powders with a relatively broad particle-size ranges. This method does not allow full control of particle shape. Bottom-up methods are based on physicochemical principles of molecular or atomic self-organization. This approach produces selected, more complex structures from atoms or molecules, better controlling sizes, shapes and size ranges. 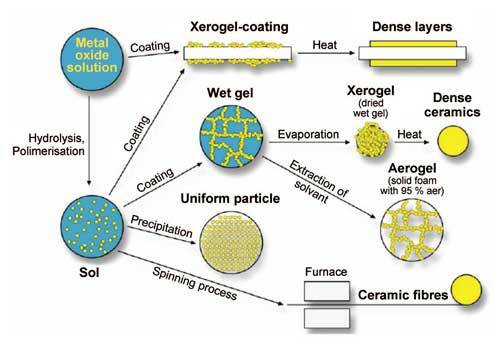 It includes aerosol processes, precipitation reactions and solgel processes (Figure 3). Gas phase processes are among the most common industrial-scale technologies for producing nanomaterials in powder or film form. Nanoparticles are created from the gas phase by producing a vapor of the product material using chemical or physical means. The production of the initial nanoparticles, which can be in a liquid or solid state, takes place via homogeneous nucleation. – In flame reactors, nanoparticles are formed by the decomposition of source molecules in the flame at relatively high temperatures (about 1200?2200°C). Flame reactors are used today for the industrial-scale production of soot, pigment-titanium dioxide and silicon dioxide particles. – In plasma reactors, plasma (ionized gas) provides the energy for the vaporization and for initializing the decomposition reactions. – In laser reactors, lasers selectively heat the gaseous source material, utilizing its absorption wavelength, and decompose it to the desired product. – In hot wall reactors, vaporization and condensation are applied. The source material is vaporized in an inert gas under low pressures (ca. 1 mbar). This removes the enriched gas phase from the hot zone. The particles created by the rapid cooling are collected on filters. Technically, hot wall reactors are used for example in producing nanoscale nickel- and iron powders. – The chemical gas phase deposition process is used to directly deposit nanoparticles from the gas phase onto surfaces. Here, the source material is vaporized in a vacuum and condensed on a heated surface by a chemical reaction, i.e. deposited from the gas phase into the solid final product. Particles can also be produced from droplets using centrifugal forces, compressed air, sonic waves, ultrasound, vibrations, electrostatics and other methods. The droplets are transformed into a powder either through direct pyrolysis (thermal cleavage of chemical compounds) or via direct reactions with another gas. In spray pyrolysis, droplets of the source material are transported through a high-temperature field (flame, oven), which rapidly vaporizes the readily volatile components or leads to decomposition reactions. The formed particles are collected on filters. The wet-chemical synthesis of nanomaterials typically takes place at lower temperatures than gas phase synthesis. 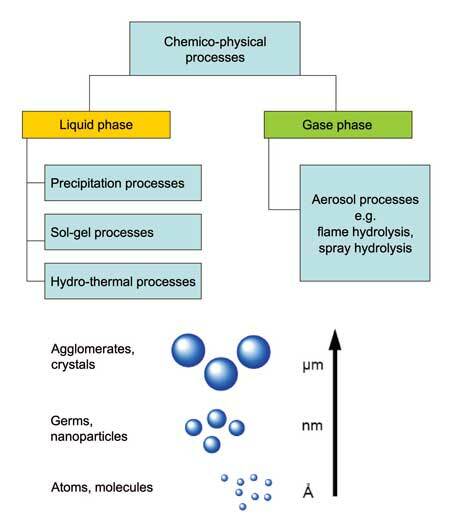 The most important liquid phase processes in nanomaterial production are precipitation, sol-gel- processes and hydrothermal syntheses (see Figure 3). The precipitation of solids from a metal ioncontaining solution is one of the most frequently employed production processes for nanomaterials. Metal oxides as well as non-oxides or metallic nanoparticles can be produced by this approach. The process is based on reactions of salts in solvents. A precipitating agent is added to yield the desired particle precipitation, and the precipitate is filtered out and thermally post-treated. In precipitation processes, particle size and size distribution, crystallinity and morphology (shape) are determined by reaction kinetics (reaction speed). The influencing factors include, beyond the concentration of the source material, the temperature, pH value of the solution, the sequence in which the source materials are added, and mixing processes. A good size control can be achieved by using self-assembled membranes, which in turn serve as nanoreactors for particle production.Such nanoreactors include microemulsions, bubbles, micelles and liposomes. They are composed of a polar group and a non-polar hydrocarbon chain. Micro-emulsions, for example, consist of two liquids that cannot be mixed with one another in the concentrations used, usually water and oil along with at least one tenside (substance that reduces the surface tension of liquids). In certain solvents this gives rise to small reactors in which nucleation and controlled particle growth take place. Particle size is determined by the size of the nanoreactors and, at the same time, particle agglomeration is prevented. Micro-emulsion processes are often used to produce nanoparticles for pharmaceutical and cosmetics applications. An additional process that is based on self-organized growth with templates and coatings is hydrothermal synthesis. Zeolites (microporous aluminum-silicon compounds) are produced from aqueous superheated solutions in autoclaves (airtight pressure chambers). The partial vaporization of the solvent creates pressure in the autoclaves (several bars), triggering chemical reactions that differ from those under standard conditions, for example by altering the solubility. Nanoparticle formation and cavity shape can be controlled by adding templates. Templates are particles with bonds that enable the formation of certain forms and sizes. Sol-gel syntheses (production of a gel from powder-shaped materials) are wet-chemical processes for producing porous nanomaterials, ceramic nanostructured polymers as well as oxide nanoparticles. The synthesis takes place under relatively mild conditions and low temperatures. The term sol refers to dispersions of solid particles in the 1-100 nm size range, which are finely distributed in water or organic solvents. In sol-gel processes, material production or deposition takes place from a liquid sol state, which is converted into a solid gel state via a sol-gel transformation. The sol-gel transformation involves a three-dimensional cross-linking of the nanoparticles in the solvent, whereby the gel takes on bulk properties. A controlled heat treatment in air can transform gels into a ceramic oxide material. To start with, adding organic substances in the sol-gel process produces an organometallic compound from a solution containing an alcoxide (metallic compound of an alcohol, for example with silicon, titanium or aluminum). The pH value of the solution is adjusted with an acid or a base which, as a catalyst, also triggers the transformation of the alcoxide. The subsequent reactions are hydrolysis (splitting of a chemical bond by water) followed by condensation and polymerization (reaction giving rise to many- or long-chained compounds from single-chained ones). The particles or the polymer oxide grow as the reaction continues, until a gel is formed. Due to the high porosity of the network, the particles typically have a large surface area, i.e. several hundred square meters per gram. The course of hydrolysis and the polycondensation reaction depend on many factors: the composition of the initial solution, the type and amount of catalyst, temperature as well as the reactor- and mixing geometry. For coatings, the alcoxide initial solution of the sol-gel process can be applied on surfaces of any geometry. After the wetting, the build-up of the porous network takes place through gel formation, yielding thicknesses of 50-500 nm. Thicker layers, suitable as membranes for example, are created by repeated wetting and drying. The sol-gel process can also be used to produce fibers. In all cases, gel formation is followed by a drying step. 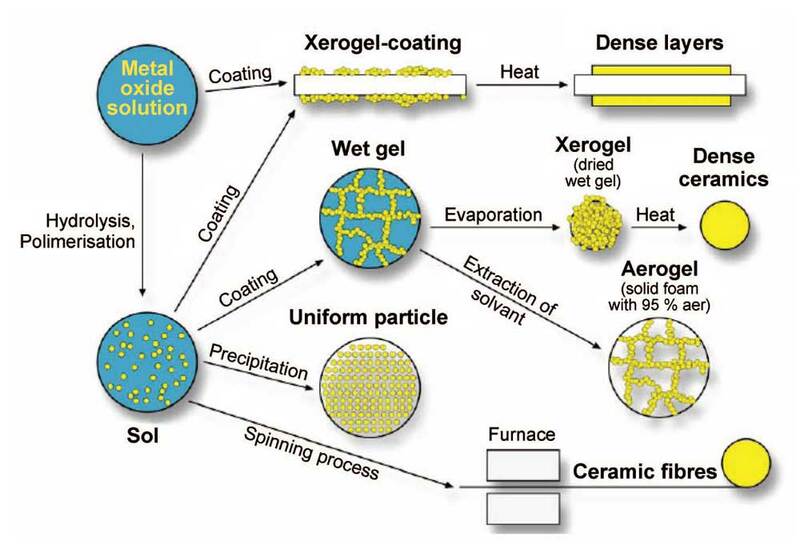 Figure 4 illustrates the different reaction and processing steps of the sol-gel process. A distinct advantage of the sol-gel process lies in the processability of the sols and gels, depending on processing step, into powders, fibers, ceramics and coatings. Moreover, highly porous nanomaterials can be produced. Composites can be created by filling in these pores during or after gel production. The low process temperature also enables substances to be embedded into the gel during the synthesis step; these can then be stored or released in a controlled manner. The disadvantage of the sol-gel process lies in the difficult-to-control synthesis and drying steps, which complicate scaling up the process. Moreover, organic contaminants can remain in the gel. The resulting necessary cleaning steps, drying and thermal posttreatment makes this production process more complex than gas phase synthesis. The disadvantage of the wet-chemical synthesis of nanomaterials is that the desired crystalline shapes often cannot be configured and that the thermal stability of the product powder is lower. This requires thermal post-treatment with repeated reduction of the particle surface. The advantage is that the liquid phase enables highly porous materials to be produced; this would normally not be possible in gas phase reactors due to the high temperatures. With a few exceptions, gas phase processes also do not allow the production of organic nanoparticles. Liquid phase processes are particularly suited for the targeted production of monodisperse product powder (with uniform particle size). Dispersion (dispersed system): a mixture composed of two or more phases in which one component is very finely distributed in another. Emulsion: dispersed system in which liquid droplets are distributed in another liquid. Suspension: dispersed system in which insoluble solid particles are distributed in a liquid.